With only two weeks left in the Alberta election campaign, the Canadian Bar Association is calling on the candidates to ensure proper funding for the justice system. “Less than one percent of the last provincial budget was spent on the justice system in Alberta and that’s not enough. We also know that for every dollar spent on justice, taxpayers save six dollars elsewhere,” CBA Alberta President Frank Friesacher said in a written release. The CBA Alberta wants funding for proper access to justice, family justice and drug treatment courts. Additionally, they would like to see additional funding for judges, clerks and admin staff to reduce court delays. 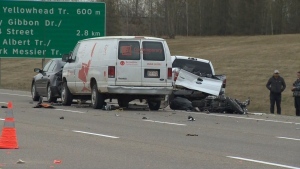 Edmonton police are at the scene of a serious crash on the Anthony Henday Drive, between 111 Avenue and Yellowhead Trail northbound.